Now I feel inspired to have a go at some patches as well. Where do I need to go to get started with editing the source code and whatnot? I have already themed this menu in my theme Nautipolis, and I’ve changed it so that the appmenu is always shown (even if the menubar is visible). I’ve been checking out the new menu in the nightlies… very cool. The one thing I can’t seem to get used to is the behavior of the split menus, though. The mouseover target to show the actual menu is very small. It’s a continual irritant… I’m so used to easily displaying submenus in every other application I use. I sympathize with bug 589146 (https://bugzilla.mozilla.org/show_bug.cgi?id=589146). @josh – https://developer.mozilla.org/En/Participating_in_the_Mozilla_project has a bunch of information, but you can always hop onto irc.mozilla.org and join #fx-team or #developers to ask people on how to get started. Looks great! How about icons for History and Downloads too? This styling is dependent upon the user having Aero in use. I use Vista and do not use Aero so I still see the titlebar and the new Menu button (this should be fixed). Also, why do I still have to display the menu bar to get to the Check for Updates command? 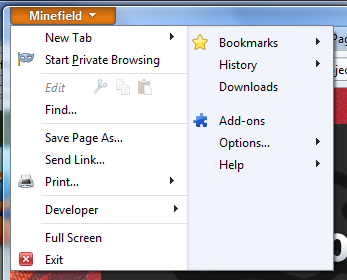 Now that we have a two-pane Firefox Menu can’t this still live under Help or Options? @Orrin – From what I’ve read, “Check for Updates” is going to be moved to a link on the “About Firefox” dialog window. Shocking! The behaviour of the arrows are bugs, Daniel, and they are on file. Thanks as always for your positive and engaging contributions. The menupanel can be technically well designed, well coded, well organized and I still have the right to think and say it’s ugly in terms not only of UI but also UX. Take it or don’t ask for feedback again. I find the new menu to be both useful it saves the use of more Icons. I do not see it as a copy of anything. Kudos to SoapyHamHocks for the design. I am using it now and it is great! Me likey, but I think the spacing on XP needs to be boosted. Can the menu be made bigger? It’s tiny, even on my 1024×600 netbook. Also, I’m not one for quoting Fitt’s law, but the target areas for those submenu arrows are very small. The popup on delay will help, but can the target areas be made bigger (particularly, wider)? Really love this approach, though. I’m not crazy about the icons, but the rest of it looks good. I don’t mind split menus a long as they don’t take 2-3 seconds to load like they do on Windows’ start menu.